The MR270 is aptX LL (Low Latency) enabled. This Bluetooth codec lets you enjoy your media with zero perceptible lag. It is widely known that audio transmission needs to happen at a rate of around 40ms to be heard in synchronisation with what you are watching, aptX LL has a latency of around 30ms, providing you with some of the best end-to-end audio transmissions. 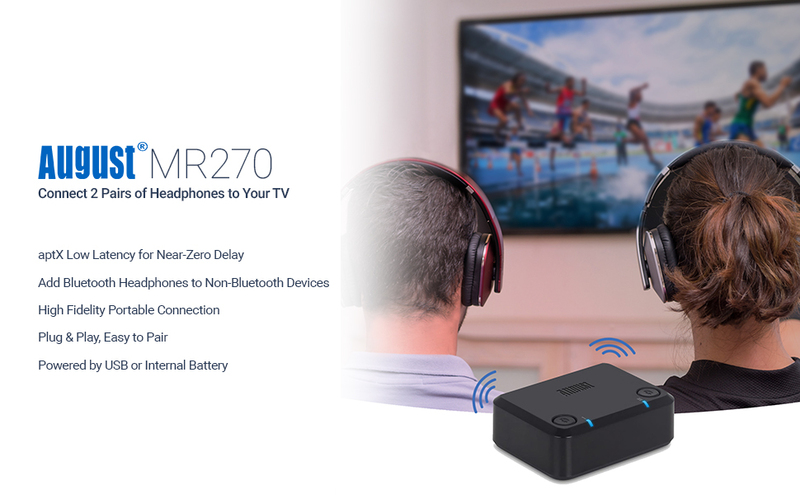 The August MR270 Bluetooth Transmitter, sends stereo sound from your TV to two pairs of headphones at the same time. Perfect for when you want to sit back, relax and enjoy your shows in the evening, without waking the kids. Just connect it to your TV via the headphone socket, optical out or composite audio out and it can transmit audio wirelessly to yours and your partners headphones in wired quality, without the need for a splitter or trailing wires. Operating via USB power allows the transmitter to be permanently plugged into your TV USB port so that you can reconnect swiftly anytime you want. Portable battery use enables listening for 15 hours playtime between charges, great for use in bed with a tablet. One of the only Bluetooth transmitters to offer optical audio in, the MR270 can be connected to almost any non Bluetooth device. And with Bluetooth version 4.1, its a simple, hasslefree and user friendly process to hook up to two pairs of headphones, a pair of headphones and a speaker, or any combination of audio devices you require. Reconnection is as simple as switching your headphones or speaker on again.